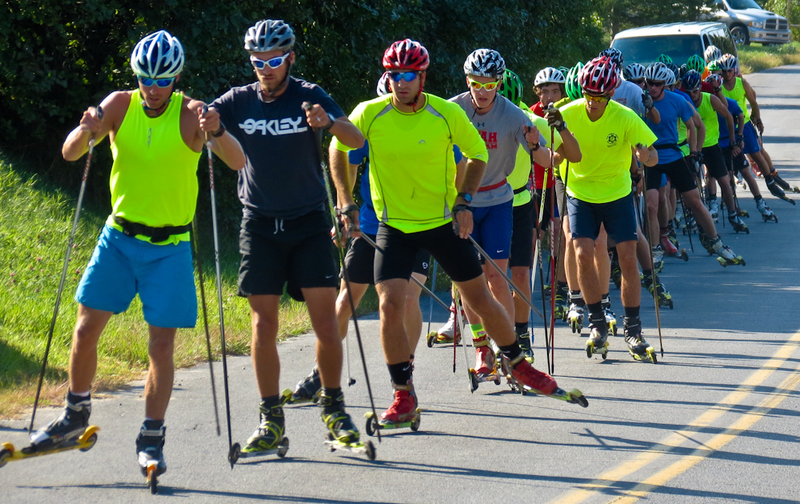 Every year the US Ski Team hosts a camp in Lake Placid to kick off fall training and bring together many of the best athletes from around the country. We recently wrapped up the camp after two weeks of awesome training with the USST, Craftsbury GRP, Team Homegrown, and a strong NENSA crew. Needless to say, the camp was a great opportunity to train with a huge crew of talented skiers. Easy 2 hour double pole to kick off the camp. 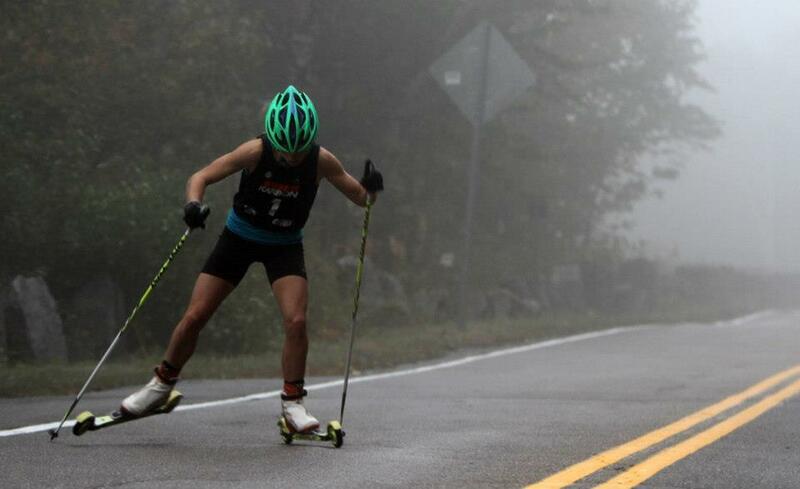 Lake Placid offers the chance to train with skiers from around the country. The focus of the Lake Placid Camp is high-intensity training. 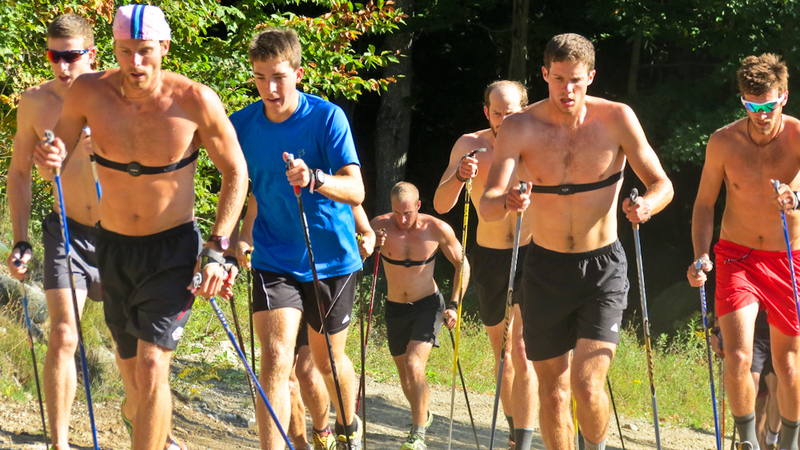 The second day of camp we kicked things off with some maximal bounding intervals up Whiteface Mountain. This workout is one of the hardest workouts of the year – the idea is to really push yourself to the limit. We did six 3′ intervals, starting at just below 10k race pace and making each successive interval faster and faster. On the last interval, I hit a HR of 206 bpm with a blood lactate of 14.6 mmol/L! It was a great reminder of what racing feels like. 6x 3 minute maximal bounding intervals up Whiteface Mountain. From Left: Ryan Scott, SMST2 athlete Andy Newell, SMS PG Paddy Caldwell, Dylan McGuffin, Nils Koons, Gordon Vermeer, and Sylvan Ellefson. Continuing the high intensity theme, we did a number of speed sessions designed to help build efficiency at top speed. We were able to do some of our speedwork at the Olympic Jumping Complex. Classic speed day at the Olympic Ski Jump Complex. Hammering out a speed with one of my old Dartmouth teammates, Patrick O’brien. Patrick was on form and had one of the fastest strides out there. While the focus of the camp was intensity, we also did a fair amount of distance training and technique work. No matter what level you are at, it is always possible to make improvements and refinements in technique that allow you to improve efficiency and ultimately ski faster. The group out on a distance skate ski. 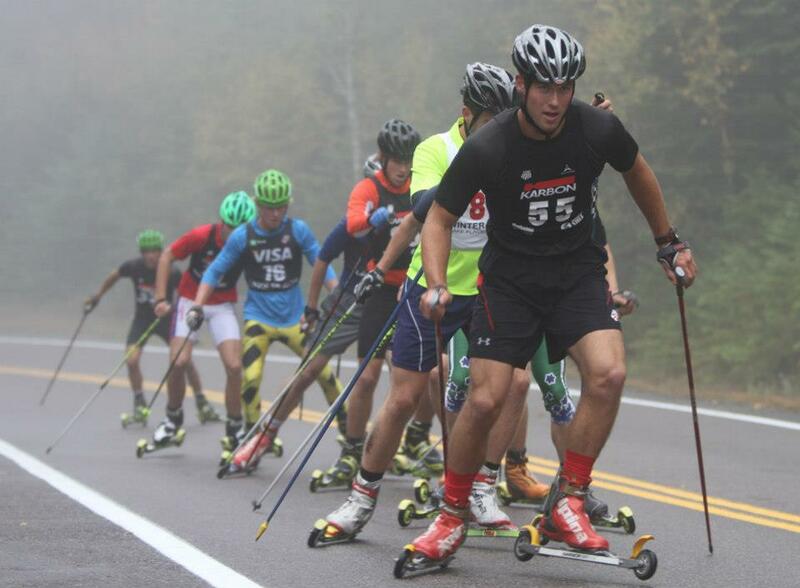 One of the staples of the Lake Placid camp is the climb to the Castle – a 5 mile rollerski race up the Whiteface Mountain auto road. From the start, the road climbs non-stop, with no flats or downhills and virtually no good places to recover. Climb to the Castle – SMS T2 skier Skyler Davis leading a train. Fasterskier image. Climb to the Castle – Tad Elliot was on form and handily took the victory. Fasterskier image. Climb to the Castle – Liz Stephen crushed it in the women’s race and won by 5 minutes. Fasterskier image. I did not have a good race – a combination of low energy, a fast start, and relatively slow rollerskis combined to make it a real struggle. I think you can learn as much from bad races as you can from good ones, so I’m taking what I can and moving forward with what I learned. 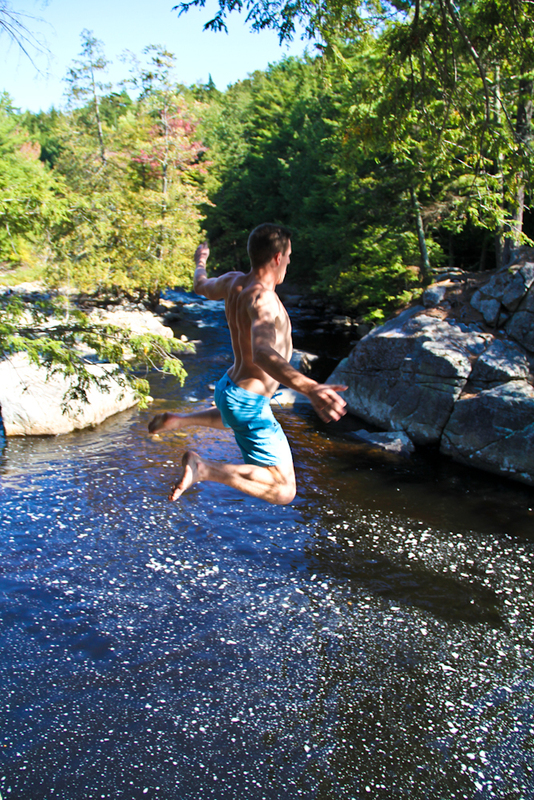 About 30 minutes outside of Lake Placid there is a really cool spot for cliff jumping called the Flume. We were able to stop by after some of our workouts to jump in. 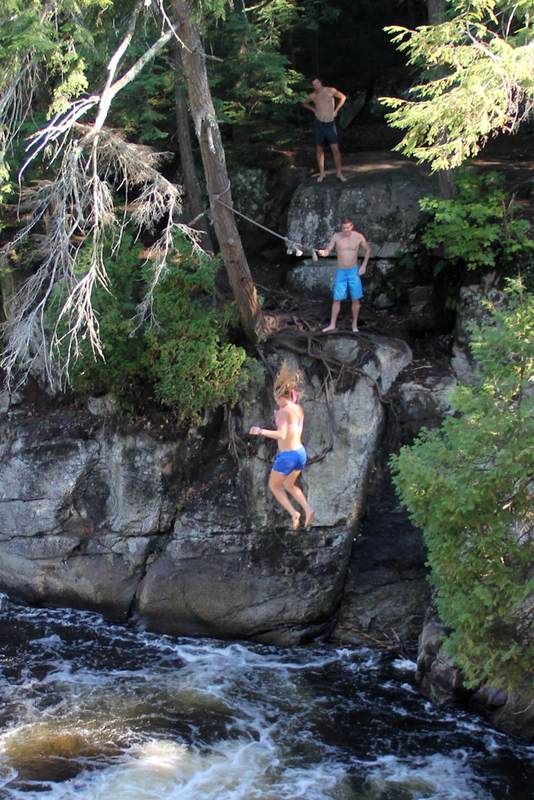 Ryan Scott jumping the flume. Newell showing how its done. Jessie Diggins making the jump, with Ryan Scott in Will Wicherski in the background. All around, we had a great camp. A big thank you goes out to all the coaches and organizers who made this camp possible. Now that the camp is over, it’s time to recover. One of the most important things as an athlete is to recognize when you need rest; the hard training is important, but the rest is what allows you to actually get faster. I came out of the Placid camp feeling tired, so I took several days easy and visited some good friends in Hanover. 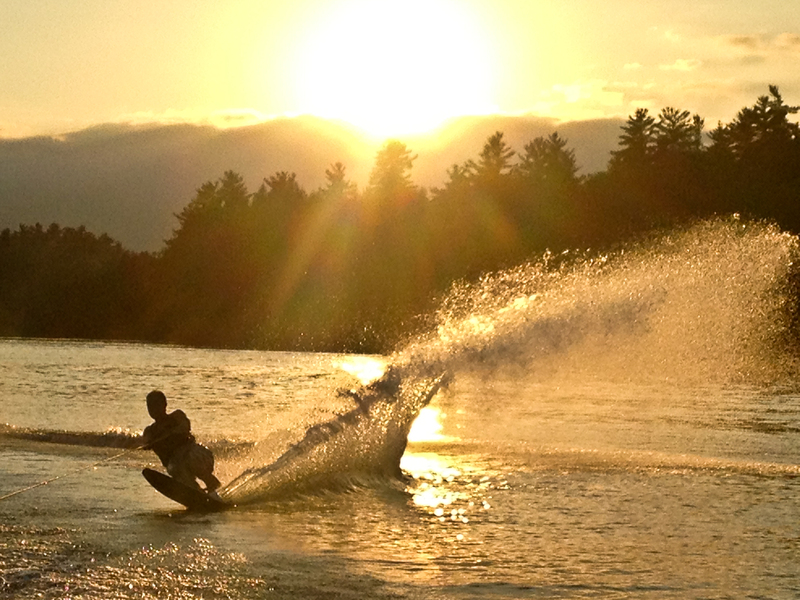 We even got out waterskiing at Ace Tarberry’s lakehouse. Thanks Ace! Sunset turns. 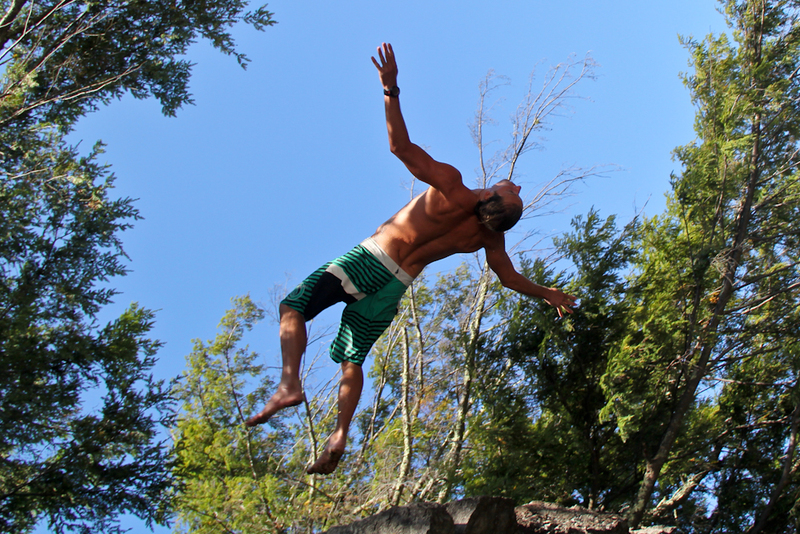 After two weeks of hard training, it was good to get out and shred the water.